RADIAL BALL BEARINGS, ANGULAR CONTACT BEARINGS, TAPERED NEEDLE BEARINGS, THRUST BEARINGS, OH MY! There are lots of choices when selecting the right size of bearings for your application, but determining the appropriate type should be first on your design requirements list. We'll only talk about three of the most commonly reference styles of bearings: "skate bearings", angular contact and thrust bearings (shown in its respective order below). In your small mill (for example in your X2 mini-mill's X-axis) thrust bearings are used to handle the axial loads and some of the radial, what little of it there is, that is.. Now, when you start dealing with your average variety bearings, you're most likely talking about radial ball bearings found in anything from your roller skates and skate boards (hence the term "skate bearings") to the motor inside your car's alternator. 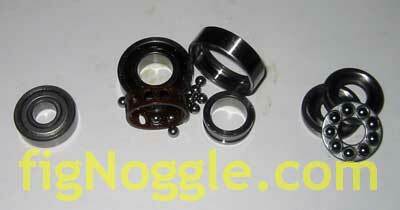 The most expensive kind of the three are angular contact bearings. These can run anywhere from $30/each on up. Why are these so special? They're designed not only to handle high axial loads but offer ways of butting two against each other to effectively create a zero axial play (backlash) setup. This is why you'll find these mainly in leadscrew journals at the driven end (while the other end uses plain radial ball bearings for support). What you may or may not know is that radial ball bearings can be used in much the same way for which angular contact bearings and thrust bearings are designed. While not optimal, it serves as a low-cost alternative to the other types. For example, a pair of shielded (i.e. 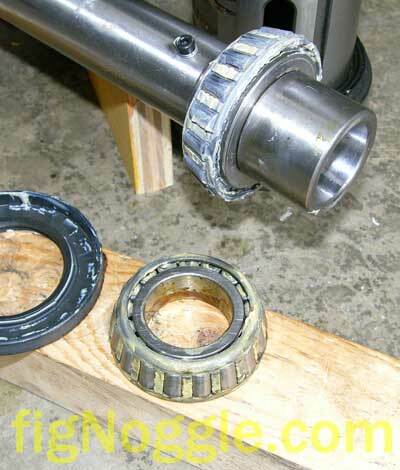 keeps the crud from the inner balls and races) skate bearings with a 3/8" inner diameter cost under $10 while thrust bearings are roughly $25 and the angular contact bearings are a whopping $60! Of course these numbers vary, but it does give you a general idea..